Moon Lamp Base by fatmurphy99 is licensed under the Creative Commons - Attribution license. I needed a base for the moon lamp by moononournation. This base fits a 5 in lamp set into the bed approximately 15mm (creating a 30mm hole on the bottom of the moon). 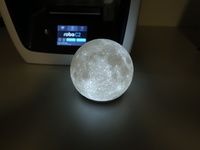 The stand included with the base allows a string of LEDs to be wrapped around it and balled at the top, placing the LEDs approximately in the center of the moon. Provides good consistent illumination. The lighting I used was Meil Micro String Light ($5 at Walmart). In a future update I will be adding a switch extension rod that goes into the base and attaches to the switch on the LED control box, as well as a support for the control box. UPDATE: v2 of the base uploaded. For some reason I had the dimensions wrong on the hole where the insert is supposed to go. I also found that recessing the top to fix the profile of the moon didn't make sense. The top is now flat, and I changed the hole size. I also changed the diameter for the protrusion at the top of the base to better fit the hole in the moon I printed (~30mm hole). This should add stability in holding the moon in place. I added photos to show how it looks when lit up, and how the wrapping of the LED string worked for me. Next update will be a cover for the bottom on the base for the LED control box to sit on, and a switch extension (the reason for the other hole on the top of the base), once I verify everything lines up like it should. UPDATE: I finally made a cover plate for the underside of the base, and an extension rod for the switch (if using the same lighting kit I did) that reaches through the small hole near the center of the top of the base. I haven't printed these two parts out yet to verify fit and function, but they should work. I will be printing soon to verify. The next version will include a version with moon rocks on top of the base to give it a neat scenic feature, and the extension rod will be topped with a rock to hide the switch and make it part of the background. I initially printed upside down, with the v1 base, but the supports were nearly impossible to remove from the indentation. Now that the indentation is gone, and there is a protrusion on top, I am printing right-side-up. For me this is a 15 hour print, but I am also trying out tree supports, which takes a lot of time and material. I believe my slicer told me 10-12 hour range with normal supports. Say thanks by giving fatmurphy99 a tip and help them continue to share amazing Things with the Thingiverse community.